Frozen transforms Hans Christian Anderson’s classic fairy tale about a villainous The Ice Queen, into a nuanced account of how social prejudice drives desperate people to commit (what are perceived to be) harmful or immoral acts. The film begins with an unfortunate childhood incident when Princess Elsa accidently harms her little sister Princess Anna, when she misdirects her magical power to conjure up ice and snow. This sets the scene for Elsa’s isolation and her life-long quest to suppress the emotions that regularly set off her strengthening powers. Fast-forward a number of years, the girls have come of age, their parents have died and the coronation of Elsa as Queen is immanent. At the coronation emotional turmoil leads to the public exposure of Elsa’s powers, which in turn catalyses a series of events including her self-imposed exile in the wilderness, the onset of an eternal winter, and Anna’s desperate attempts to reconnect with her sister and undo the environmental disaster. What I want to zero in on here is the very interesting subversion of normative gender roles by Disney, whose fairy tale adaptations have historically emptied original narratives of their sophisticated accounts, of young girls negotiating a moral minefield to emerge experienced and worthy women. Within the Disney canon, feminine agency has largely been the province of the bitter and twisted villainess; the good girl is distinguished by her willingness to wait patiently for a strange prince to rescue her from the maws of certain doom (think Snow White, Sleeping Beauty and Cinderella). But wait you say, the 1990s ushered in a period of Disney animation characterised by feisty princesses whose adventurous spirit could not be tamed (Belle in Beauty and the Beast, and Ariel of The Little Mermaid come to mind). While this may be so, the narratives of these films are still characterised by the motif of romantic love, and impossible stereotypes of idealised, chivalrous men. Narrative resolution only occurs in these films when the princess secures a relationship with the prince of her dreams. What I want to suggest is that far from a straightforward subversion of harmful gender stereotypes and narrative motifs, Frozen actually propagates a slate of contemporary ones that are quite reflective of the kinds of gender inequality that exist today. At the outset I would like to acknowledge the fantastic plot twist whereby the act of true love needed to save Anna, ostensibly the films principle heroine was not a kiss from her prince but rather an act of self-sacrifice to save her sister. The film explicitly flags this resolution as act of narrative subversion much earlier in the film. Anna, having been accidentally wounded by Elsa during an ill-fated attempt to reconcile, seeks the kiss of her true love Hans to save her from certain death. As Hans slowly leans in to kiss the ailing Anna, he pauses, pulls back and reveals that he cannot save her because he does not love her. Indeed, he has deceived Anna into loving him so as to become king. After this startling revelation, he promptly leaves Anna for dead. It is Hans’ cold manipulation of the hapless Anna that foregrounds my key problem with the film; that is, the replacement of negative female stereotypes with negative male stereotypes. Let’s take a closer look at our four key male characters. Once informed that Elsa’s powers will grow and could be potentially detrimental to the kingdom, the King effectively imprisons his young daughter. She is denied supportive relationships and taught to bury her emotions so that they will not negatively impact upon others. His failure to seek guidance and mentorship to help Elsa through this difficult phase of childhood development is ultimately neglectful, yet the film does not really draw attention to him as a harmful figure in Elsa’s life. He is merely a plot device to catalyse the narrative, a stopgap that once removed, unleashes terrible misfortune upon his kingdom. The Duke is another one-dimensional character that largely serves the function of red herring, prompting audiences to assume that he is the villain of the piece. This tiny leader of Weasel town is clearly only interested in exploiting trade relations with the kingdom for its own profit. 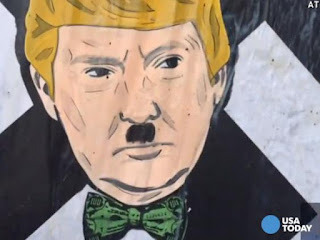 He is in this sense, an embodiment of what feminists like to refer to as patriarchy, embodied in the image of middle-aged white men who govern the economy for their own benefit, and to the detriment of unsuspecting and benevolent women. The physical rendering of this character, combined with his capitalistic motivations, certainly embodies this villainous image of patriarchy. 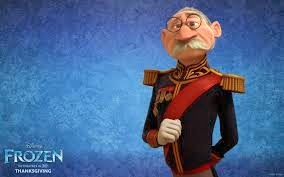 Early in the film Hans is the embodiment of the noble prince desired by princesses everywhere. He is however another fairly under developed character allowing for the plot twist exposing his conniving, self-interested and heartless character. 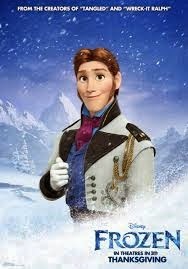 This is not in itself a problem, every Hollywood plot needs a villain to keep the drama rolling, and as stated above, Hans is key to blowing apart the myth of romantic love and unrealistic expectations of masculinity. 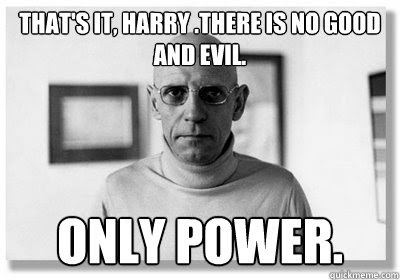 Hans however, also serves to round out a stable of negative male characters that tell us that: man + power = evil. 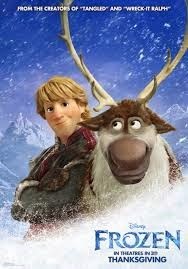 With Kristoff we come to the hero of the piece. Kristoff is humble and hardworking member of the working poor. This is clearly indicated in a sequence when he unsuccessfully haggles for basic supplies. His massive and muscly stature implies that he must engage in difficult manual labour to earn the pittance that he lives off, this is also indicated in the opening sequence representing the hard labour required to harvest blocks of ice, Kristoff’s stock in trade. Kristoff’s benevolent humility is reiterated via his interactions with Anna, whereby he regularly assumes his proper place below Anna in the social hierarchy (as both male and working class). For instance, when Anna prematurely rushes to scale the mountain, Kristoff who is more knowledgeable about achieving such a task, hangs back and waits for her to realise that she needs his help. This reminds me very much of old US family sitcoms where the obedient wife, who the audience recognises as more knowledgeable than the domineering husband, waits for him to come around so that she can dispense her expertise in an unassuming and non-threatening manner. Most pertinent however, is that Kristoff very much conforms to what Karen Straughan has termed “the disposable male.” An evolutionary psychologist, Straughan posits that men have predominantly come to be valued in society only insofar as they are willing and able to sacrifice themselves for the benefit of women and society. Kristoff regularly engages in acts of self sacrifice, for instance, when he sacrifices his own happiness and delivers Anna back to her “true love” Hans to be healed, and also, when he places himself in danger and helps her track down Elsa. Sacrifice, as a demonstration of male worth, is one of those under-acknowledged phenomenon’s that abound in everyday life. Think for instance of celebrations and memorials for war heros who have sacrificed themselves for the good of the nation-State. Think also of the fact that it is men who are expected to assume more difficult and strenuous forms of manual labour, detrimental to their long-term physical health. That men have come to fulfil these roles is largely a part of human evolution; humans are dimorphic, and men are for the most part, the naturally stronger gender. However, in contemporary Western cultures, where it is assumed that democratic freedoms have liberated humans from the shackles of biology and enabled everyone to craft their own destiny, men - like women, the disabled, homosexual, transgender, black ethic and other minority peoples – are in actuality, limited by enduring economic constraints and social prejudices. Contemporary understandings of gender inequality, largely influenced by decades of feminist activism, tend to obscure the ways in which many men are also constrained by social norms. Think, for example, of campaigns calling for economic inequality that focus on women’s access to corporate leadership roles rather than the ability to work side-by-side with men in sewerage treatment plants or on the military frontline. That Kristoff is the only positive (human) male character in Frozen contributes to the widespread misapprehension that the only good men in society are those that are willing to sacrifice their lives and wellbeing for the common good. This I think is the key problem with Frozen. In line with current social trends, the film’s attempt at gender subversion is mired in the misconception that women are singularly disadvantaged by cultural representations. The lack of critical attention to forms of gender inequality that also effect men just creates a situation in which the pendulum swings the other way, and women become blind to the specific ways in which they are privileged by their gender. And this is detrimental to BOTH men and women. What will girls gain from unrealistic perceptions of men as subservient, expendable or evil? Like the trope of prince charming and true love dispelled by Frozen, these misconceptions of masculinity do not inform the pursuit of meaningful and equal relationships, but rather, continue to fuel unrealistic expectations of men.